Determining core values needs to be a Spirit-led process. Although we borrow strategies and exercises from the secular world or businesses, we must never forget that we are part of the Kingdom of God. As such, God is leading, not us. We need to listen with an open heart and a spirit of sensitivity. No statements, and no preambles. Questions only. Then silence as people reflect and then pray out loud their questions. Sometimes there will be long periods of silence in between questions. That’s okay. Someone quietly writes down all of the questions as they are prayed aloud. I find that this exercise works well not just for values identification, but for many other leadership issues where the team needs to hear from the Holy Spirit as well. And although the practice is originally from the Quaker tradition, it’s quite compatible with many different Christian traditions. After the time is finished, the leader closes the prayer. Then he or she asks the group, “What words or pictures did you get as we prayed that may have been from God?” This allows people to process the experience and share what they were hearing. Look for our next blog entry on the process of identifying core behaviors. 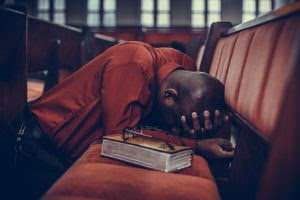 The post Listening prayer: Asking God questions appeared first on Logan Leadership.